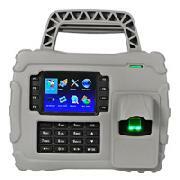 Wipaq is the supplier of S922 Portable Fingerprint Attendance Machine in Dubai, UAE. S922 portable fingerprint particularly designed for the use of construction sites, big farms, mining and logistics business. This portable fingerprint machine comes with built-in 7600 mAh battery, card capacity of 30,000 and fingerprint capacity of 5,000 (can be upgraded to 10,000). It has a rubber coated shock proof for the protection. It is also rated as waterproof and dustproof by IP65. S922 has multiple authentications like Mifare or ID Card and Fingerprint.